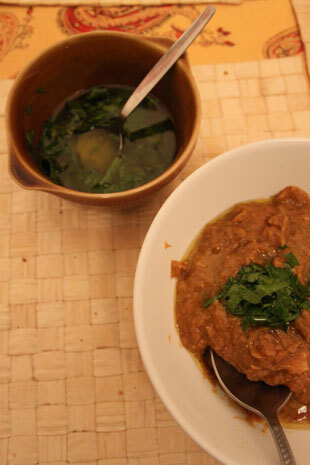 Soup Time/Winter Time: Lentil & Sweet Potato Soup with Lemon-Parsley Drizzle – Eat Me. Drink Me. Let’s not get technical. I know it’s fall. But unless you too are living in Berlin – waking up every morning moaning about having to leave the comfort of your covers, wearing your winter coat inside, and wishing the heater went up just a few more notches – and want to argue with me, it’s winter. I made my first soup of the season the other night. 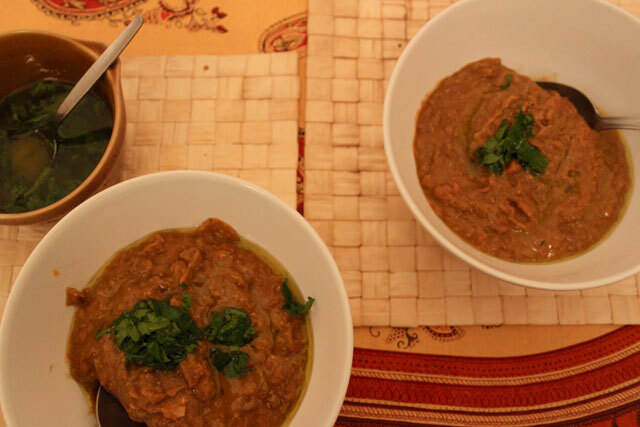 A lentil stew sweetened with carrot and sweet potato and brightened with a touch of curry and berbere. I might have gone a little overboard with the lentils. By the time I’d added everything to the soup, it filled the pot. I will be eating lentil soup for years, I thought. What I forgot is that it’s winter, and that in winter, everyone is craving soup. 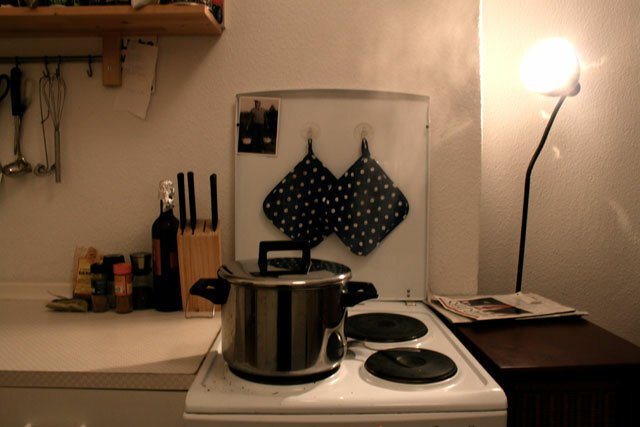 That night, a few friends met at my apartment before heading to a party, and when I checked the soup pot the next morning, everything was gone. Heat olive oil in a large pot. 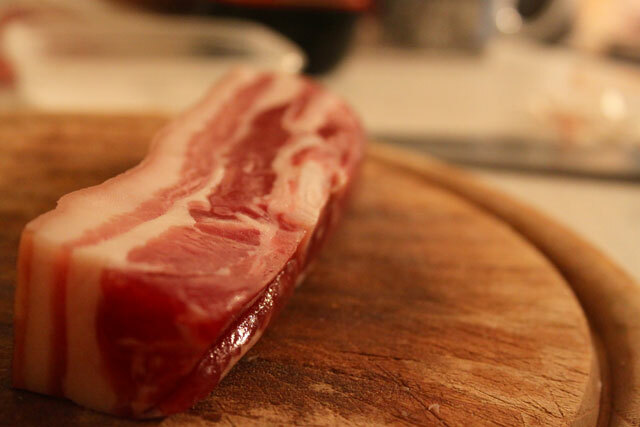 Add bacon (I used cured pork belly, which sounds fancy, but in Germany is the kind of thing you get at the discount grocery store for a euro fifty) and fry until crisping. 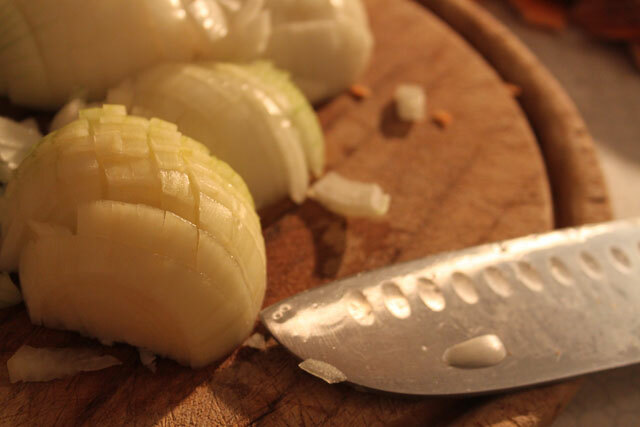 Add yellow onions and sauté until translucent. Add sweet potato and carrots and cook until just tender. 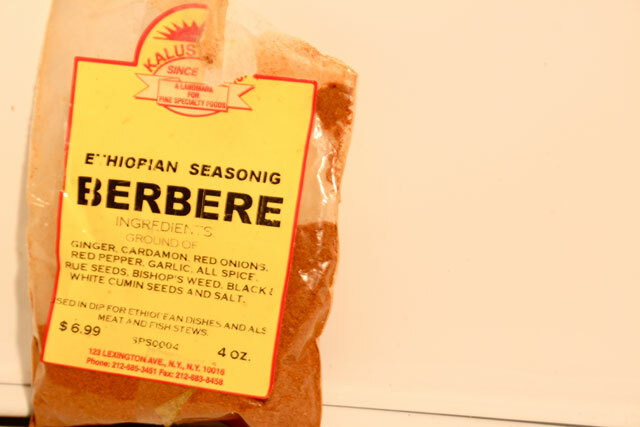 While the carrots and sweet potato are softening, add salt, cracked black pepper, berbere spice, cumin, turmeric, chili powder and curry powder. When your vegetables have softened, add quick-cook lentils and make sure to coat them with oil and spice before adding vegetable bouillon cubes and water to cover everything in the pot by about 1 inch. Bring to a boil, then turn heat to low and cover pot with a lid. Now go away. Do something else. Read a book. Cuddle with a puppy. Try on all of your sweaters. 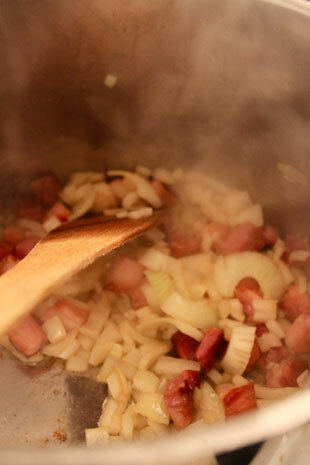 Check on your soup every now and then, and if it starts to get too thick, add another cup of water. Taste to adjust seasonings. For sure you’ll need more salt and pepper. 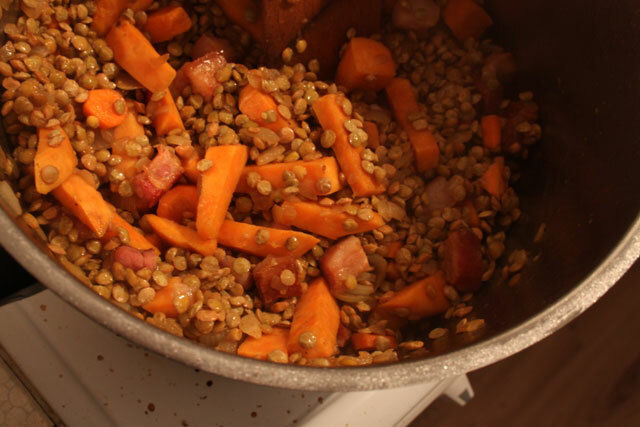 This soup doesn’t take long to be “ready.” The lentils cook in about 15 minutes – but you want to let the flavors meld as long as you can, say 2 hours. Whenever you decide you’re ready to eat, use an immersion blender to puree your soup and add water to adjust thickness, if necessary. I served my soup with this delicious lemon-parsley sauce which I had at a dinner party the other night. Whisk together olive oil and lemon and loosely chopped parsley. Season with a pinch of salt and pepper.